Page 1: Elementary Instructions and Spin! 1940s - early 1970s. Subbuteo Basic Rules 1947-75 (this page), 1976-2002. Subbuteo Football boxed editions, Five-a-side and junior versions. Any game needs a good set of rules if it is going to be successful. The best games tend to be those that are initially easy to pick up but become more complex and tactical as you become more experienced. This is certainly the case with Subbuteo. The "flick" itself is straightforward, and most new players will be familiar with the rules of real Association Football which is a big help. 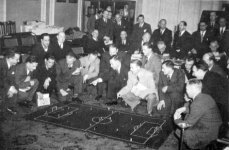 However, whilst Subbuteo tries to stick closely to real Association Football, it obviously needs its own rules and regulations too. Like any long running game or sport, these rules have been subject to various tweaks and changes down the years. That said, the core of Peter Adolph's original elementary rules do survive intact. Even in the early days, Peter Adolph's rule books are full of illustrations and photographs, which make them interesting items in their own right. So the purpose of these pages is too show the different books that have been produced, and to chart the changes in the rules. The Subbuteo instruction books were originally split into three leaflets, two of which were supplied in the boxed edition. The key booklet was the "Elementary Playing Instructions and Rules", which was all you needed to play the game at home. Then there was "Spin! ", which simply provided four different exercises to help perfect the spin and swerve of players. The final book was the thicker "Advanced Rules", which included all the rules needed for serious tournament play. This was Set C (and later C116) in the accessory range, and is covered in more detail under those entries. This situation continued into the late 1970s, when all three books were amalgamated into a 20 page Subbuteo Handbook. This was a little off putting for beginners, so the Elementary rules was again separated in the early 1980s, before being re-written to a new standard (and in several languages) on the familiar "green sheet" rules. These instructions were in the form of simple four page A5 booklets and were supplied with every edition of the game from the 1940s until the mid 1970s. As there are no rules on the front page, and the interior has large illustrations, and (in the earlier books) adverts for the advanced rules, you can see that the rules did not take up much room. They were deliberately kept simple, and thus it was easy to pick up the game and start playing. None of these rule books have a date mentioned anywhere on them, so my dating here comes from the catalogue supplied in the sets from which these books came. This means that I don't know the full date ranges of these booklets. I'm going to start this section by quoting the 1949-50 rules at length, and after this I'll just mention the changes that take place in each subsequent reprint. This is the earliest set of rules I own, and they were supplied in an Assembly Outfit from 1949-50. The booklet is divided into five sections. 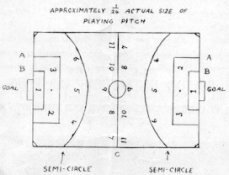 Playing Pitch - "Place a smooth, but thick cloth on a table, and chalk out a design to the dimensions printed below..."
The playing area was 48x32 ins, and so it remains to this day (except that it is now given in metric). Of course, the obvious thing about the above illustration is the semi-circular shooting areas. These "start 9ins from the centre spot, with ends meeting the touch lines 15ins from halfway". However, Peter Adolph is already rethinking this, and further on the rules direct you to the alternate shooting area idea that is mentioned in the Spin! leaflet. This section also mentions "line up", which tells you how to set up the goalkeeper, and advices numbering the team. Movement of the Football Player Figures - After explaining that the figures are scientifically balanced, the book sets out the famous flick (err, but not for left-handed people like myself). "Place the first finger of the right hand (or second finger if this feels more comfortable) immediately behind a figure, with the tip of the nail just touching the table. Use the table slightly as a spring, and gently flick the figure against the ball. "Do not use the thumb as a spring. The thumb does not enter into the propulsion", and so crucial is this, that the line is highlighted. Okay, so if you are left handed, or you bite your nails, the instructions might be slightly different... but I think this is about as clear as it can be. The finally part of this section explains about goalkeeping and suggests holding the left side of the goal with the left hand, while you manipulate the goalkeeper with the right hand. Play - A section that describes the fundamental part of play, starting with the kick-off. "A coin is tossed for 'ends': losing team 'kicks off'. The centre forward (figure numbered 9) is propelled gently against the ball... If the ball has not touched an opponent figure, the team which 'kicked off' is still in play. A nearby figure is aimed at the ball, and so long as the player of the team is hitting the ball with one of his figures, and the ball does not touch an opponent figure, he is still in play. "Immediately he misses the ball with one of his figures, or if the ball is 'kicked' against a figure of the opposing side. it is the opponent's turn to play. The figure which last touches the ball represents the team which is in play, unless the ball is 'kicked' off the playing area itself by that figure." Clear ? Good. Goal Scoring - Before a shot at goal can be made, both figure and ball must be within the semi-circle ... or if you prefer, play to the rule ... in the "Spin" leaflet." Goal Kicks - One of the 'backs' takes the goal kick...."
Individual Figure Kicking - "No one figure may hit the ball more than three times in succession. After a third successive kick another man of the same team must play the ball." This is one of the cornerstones of Subbuteo football. Throw In - "...is taken by 'kicking' the ball in the usual manner, but the player must not follow over the touch line at the time of delivery: if it does, the opposing side takes the 'throw' as it was a 'foul throw'." Designed to stop you throwing the ball to the other side of the pitch, this rule can get frustrating unless you a) take about an inch run up to hit the ball (with the player hopefully stopping stone dead) or b) you use the long throw down the line approach where you face the player down the field, and hit the ball at an angle so the player swerves off the field. This second version might be a bit of a cheat, as a great length of throw can be achieved. Fouls - "If during play a figure hits another figure of the opposing side, without first touching the ball, a free kick (or penalty... if... appropriate) is awarded against the guilty figure's team." Penalty Kicks - "At a penalty kick the goal-keeper must be level with its own line. Figures of both teams who were between the defending goal line and the penalty spot at the time of the foul, must be moved in a straight line to the level of the penalty taker"
Injuries - "Any player is considered injured, which during the course of play travels over either goal line within the posts without a goal at the time being scored. The figure must remain off the 'field' for five minutes." Placing of figures - "Immediately preceding a 'goal kick' the figures of both sides may be moved back, or either way sideways, from where they stood at the time of the ball crossing the goal line, but not in the direction of the opposing goal, unless they are in their own defensive half when they are allowed movement as far as the centre line. Immediately preceding 'throw-ins', 'corner kicks' and 'free kicks' each team may flick one figure for marking purposes". The original form of a rule that has changed several times down the years. Duration of game. Twenty five minutes each way is the advised duration of play. Playing Pitch - No shooting area is mentioned in the instructions on how to mark up the pitch. Goal Scoring - "Before a shot at goal can be made the ball must be nearer to the opponents goal line than the half-way line, and the shooting figure must be within the opponents half". This version still has a flat game on the front cover (with metal flags and goal grips just visible). However, the two "flick" illustrations are now using OO scale figures, and the back page shows a game with the red fence and short-sleeved heavyweights - so this must be an early 1960s version booklet. I also know that this was the booklet supplied in the 1967 editions of the game. There are some slight grammar changes in this book (e.g. 'does line up' to 'lines up'), but the main rule changes are as follows. Play - New sentence added - "Goalkeepers do not alter possession of the ball, and regarding this are neutral." A sensible rule clarification that keeps the attacking team in possession after a save. Goalscoring - The need for the shooting figure to be inside the opponents half is dropped. The rule regarding the ball remains the same, but a shooting line is suggested. "An excellent method of determining the distance for shooting is to draw in a line across the field 11 inches from the goal (with chalk or white ink) and making a rule that the ball must be more inside this 'shooting area' than out before a shot can be made at goal." Flicking - A new rule, but again more of a clarification than anything. "The player figure must be flicked cleanly, not knocked or scraped. Free kick should be given on breakage of this rule." Goal kicks - Can now be taken by "action goalkeeper if possessed." Injuries - The old rule is scrapped, and the new one deals with breakages. "A figure is considered injured, if during the course of play it comes apart from the base, or suffers some other damage as to make it unplayable" (i.e. your knee crushes it) "it may be removed from the field and be repaired. On repair, it may be brought back into play but if suffering from a further injury must go off the field for the remainder of the game." Placing of figures - Another rethink for this one "Figures may be placed in position at the taking of goal kicks and free kicks, they may be placed anywhere except as follows. Not more than three figures in the penalty area for defence. No player may be placed in the opposing 'shooting area'. "At the taking of a corner each side (attacking side first) may flick three figures for positioning and marking purposes. At throw-ins one figure each side may be flicked." The date for this one ('69) appears in the printing company's details on the back page. This also seems to tie in with the fact that it has the 1970s logo but mentions 1960s money (one shilling). My version of this book came from a 1972 club edition, and it may well be the final version of the "elementary playing instructions" in this old format. "Only Subbuteo miniature football figures are scientifically designed and balanced to swerve and spin at the player's will and recover their upright position when played." Some of the changes are for the better though. For instance, the book still has the five rule sections, but the "Movement of the Football Player Figures" heading has been simplified to "Playing the Football Figures", and "Play" is renamed "The Kick off and After" - both clearer titles for their sections. The rules are moved around a little, and a few changes do occur within them. Flicking (kicking) - This becomes the first rule, and amalgamates the "flicking cleanly" rule introduced in the previous book, and the "three flicks" rule. Positioning of Figures - The old "Placing of Figures" section is renamed, but the rule remains unchanged. Playing Time - replaces the old "Duration of Games" section. The recommended length of games is now "twenty minutes each way" rather than the twenty-five minutes previously stated. In the mid 1970s the Elementary Rule book is amalgamated into a big handbook containing the Advanced rules, and the Spin! booklet. This is looked at in detail on page 2 of this trawl through the rule books. To finish this page off, I'm going to have a quick look at Spin! "Flick and spin to weave and win"
1940s version: This one sets out the format of this leaflet, with a front cover explaining the concept, a couple of promotional photos inside, followed by the four exercises, complete with explanations. 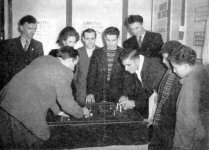 The two photos from this one show some football stars playing the game at the Schoolboys' Own Exhibition. The players in the first picture are Fred Ramscar (QPR), Ivor Powell (Aston Villa and Wales), Reg. Allen (QPR), and George Smith (formerly QPR, Brentford and Charlton - now coaching). The second picture is later used on the front of the elementary rules, and has Reg Allen saving from Peter Adolph. (Note: Mr Allen is QPR's goalkeeper here, whereas he has transferred to Man Utd by the time of the 1950s booklet). 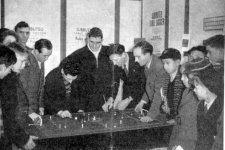 1950s version: In this one, the promotional pictures are Sir Stanley Rous and prominent referees watching a game, plus Joe Harvey, Captain of Newcastle Utd celebrating winning the 1951 FA Cup with a cake decorated with Subbuteo figures in the colours of Newcastle and Blackpool. 1969/71 versions: These are the Subbuteo Sports Games Ltd versions, and see a cover change - with a little colour added. The "How to Spin" bit is now inside the booklet. The pictures are the referee one (now on the back) and a OO scale match with the standard heavyweights. The 1971 reprint adds "England" to the Subbuteo address, and loses a text banner and the words "new type" for the continental stuff. Again, the text is rewritten from the Peter Adolph version - sometimes pointlessly. This is also where a big error creeps in. The "Left Boomerang" is renamed the "Left Boomerang Shot". It clearly isn't a shot folks. The black circles are the bases of the team which you are manipulating . The white circles represent your opponent's figures. The arrow points to the part of the base which should be flicked. "The bases should be flicked very lightly with either the hand itself upright, or on its side, according to the position. When you wish the figures to spin to the left, you flick on the right side of the base; when you wish the figure to spin to the right, you flick the left side. Reverse Turn: This is of assistance when you are facing your own goal and desire a quick turn with minimum of flicks. Anti-Foul: This enables you to touch the ball without fouling the opponent figure. Long left swerve: Your figure will reach the ball, provided the correct amount of propulsion is given, and 'carry' it at its 'feet' for a short distance. Left boomerang: A difficult spin, but very spectacular when successful and of great assistance in awkward moments. I've always found spin flicks to be a bit like "doubles" in snooker. They look impressive and are great fun to do, but they go wrong more often than not - usually leaving a chance for your opponent. This means that many serious players prefer to play a figure that is further away, but in a straight line, rather than swerve a player from a difficult position. Which is why flat based Hasbro figures are popular. That's all for this page, but more rules can be found on Page Two, as we look at the rulebooks from the late 1970s onwards..
Subbuteo Basic Rules 1947-75, 1976-2002.